Metronom, Other software for iPhone / iPod Touch / iPad from Monoplugs. 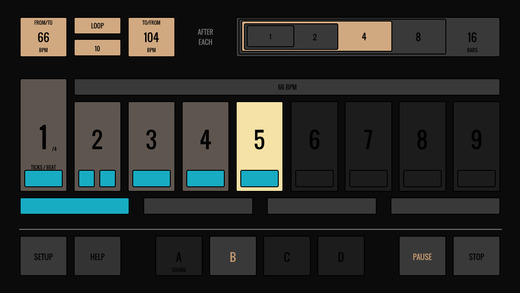 Monoplugs has launched on the AppStore a metronome app with rhythm trainer features. Metronom is intended for musicians who want to practice their rhythm: along with 4 standard metronome sounds, you’ll find on the app a full trainer with increase, decrease and loop features, speed change after 1, 2, 4, 8 or 8 bars, the ability to choose between different time signatures (2/4 to 9/4) and metering (quarters, eights, triplets and sixteenth notes) and you can edit each step independently. You can also program a count-down. Electronic musicians will also find a MID master clock sync feature so they can use Metronom with their compatible software or hardware. 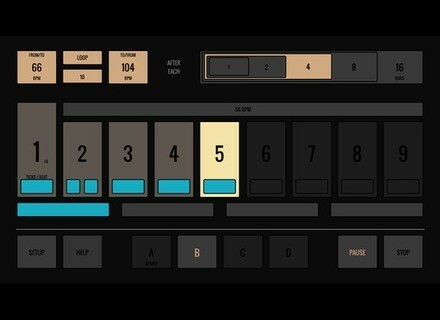 Metronom is available for $/€ 0.99 at the AppStore, it is compatible with the iPhone, iPad and iPod Touch. A version for Windows, Mac OS X and Android is also planned. The Sonic Charge Echobode in VST and AU formats Echobode, the delay and frequency shifter that Echobode initially launched on Reason is now available in VST and AU formats for Mac and Windows. MusicLab RealEight virtual 8-string guitar MusicLab completes its Real series of guitar plug-ins with a new sample-based 8-string model designed for rock and metal. Native Instruments offer on the Komplete series Native Instruments has launched a deal for Komplete users who haven’t purchased their Kontrol S keyboard yet.